A jury of eminent Philadelphia architects has selected the house of David and Janet Bay on Langford Creek to receive a Citation for Excellence in Architecture. Chestertown Architect Peter Newlin designed the house for the Bays, who moved here from the Philadelphia area. The Chesapeake Bay Chapter of the American Institute of Architects will present the award to the architect, the builder and the owners in Annapolis on Nov. 18. Newlin said he designed the house knowing what the Bays had in mind. "The Bays wanted a nicely crafted house, for their retirement, he said. They had bought a lot in Langford Estates, a narrow piece of a farmers field which had been sliced into as many riverfront lots as possible. They relished the opportunity to restore a rural character to the landscape, and asked for a quiet and timeless house. We designed the Bays' house to be peaceful, inside and outside, but with some surprise in the interior. 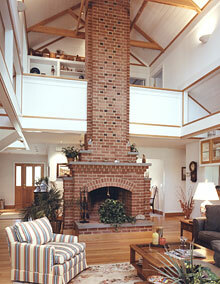 A graceful stair greets visitors and a powerful chimney anchors the living room,” Newlin explained. “Landscape Architect John Gutting also deserves a lot of credit for the fit of the house with the landscape,” Newlin said "He and the Bays worked hard to recreate a natural site.” Gutting works and lives in Church Hill, Maryland. The jury complimented Newlin’s "fine details”, adding "thumbs up for the contractor". 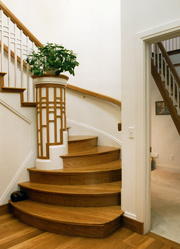 Newlin worked with local builder Patrick Jones, a partner of AlIen/Jones, Inc. of Chestertown. 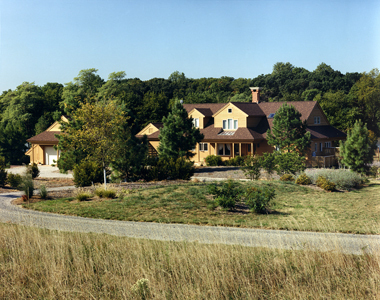 The Bays’ is the fourth house designed by Newlin to receive an award in recent years, three of which have been built by Patrick Jones. All of the homes honored have been on the Eastern Shore. Newlin heads Chesapeake Architects, of Chestertown. Established two decades ago, the firm has won state, local and national awards for their contemporary design, restoration work and energy-conserving commercial design.